Home > Mines > Mines GT-R parts. MINE'S has seemingly had a GT-R since the day it went on the market (likely before) and has already developed a new exhaust, catalytic converter, plus front and rear rotors for the R35. 400mm slotted rotors is what it says. 20 mm up. Just in case you need 20mm larger rotors. I wonder what kind of Mack truck they came from. 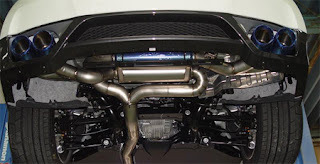 Also the exhaust , the exhaust, who , why, why, twin still ? Why still four useless tips ?